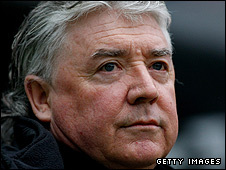 Newcastle United manager Joe Kinnear has returned home to continue his recovery after undergoing triple heart bypass surgery. Kinnear was released from hospital on Saturday and is expected to be off work for at least two months. The 62-year-old, who has a history of heart trouble, was taken ill before Newcastle's match at West Brom last Saturday, which the Magpies won 3-2. "The doctors said it went well - I feel OK," he told the club website. Kinnear's side took a point from their clash with Everton this Sunday - a game Kinnear promised to follow on television. Assistant Chris Hughton and Colin Calderwood have taken charge of team affairs in Kinnear's absence and have the task of guiding the Magpies to safety. A five-point cushion currently exists between the Tynesiders and the relegation zone, although they have meetings with Manchester United, Chelsea, Arsenal, Liverpool and Aston Villa, the current top five, before the season ends. Kinnear, who had a heart attack 10 years ago while in charge of Wimbledon, had spent several years out of football before taking over in the wake of Kevin Keegan's departure in September 2008. Earlier this month, Kinnear delayed signing a contract extension, revealing he had been offered an improved two-year deal to stay at St James' Park.